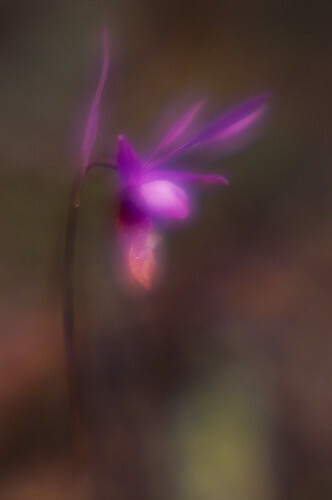 This is an image of an orchid I made today with a new lens, the 85mm f/1.8 Lensbaby Velvet. 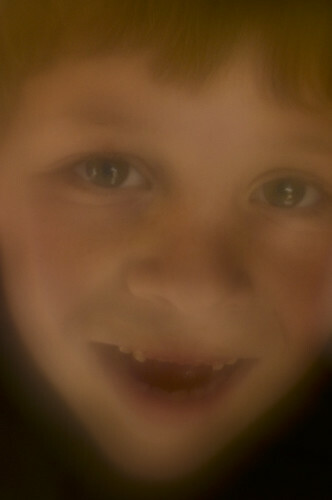 This is a lens designed to create a glowing effect in the center, hence it has applications for portraiture. Since the lens is also fairly capable in terms of close-ups (it focuses to 1/2 life size), it also seems like an optic that has potential with botanical art. In any case, it is quite a bit of fun to play with! I haven’t had fun with anything Lensbaby in quite a while (since 2010), but back in the day I used older Lensbaby optics quite a bit. You can check some of these out by clicking here. Waiting, photo by Harold Davis. View this image larger. My Mom came back from giving a workshop in Guatemala. Late last night found me at SFO to pick her up. Waiting. The plane was late. Next, the wait for luggage. Not Godot, luggage. I was bored so I snapped this distorted photo of the carousel using my Lensbaby Composer with the fisheye optic, at 1/15 of second using the f/5.6 aperture ring and ISO 100, hand held. Waiting for luggage, or Godot—whichever comes first—with a fisheye lens. Magnolia World, photo by Harold Davis. View this image larger. This is another Lensbaby fisheye. 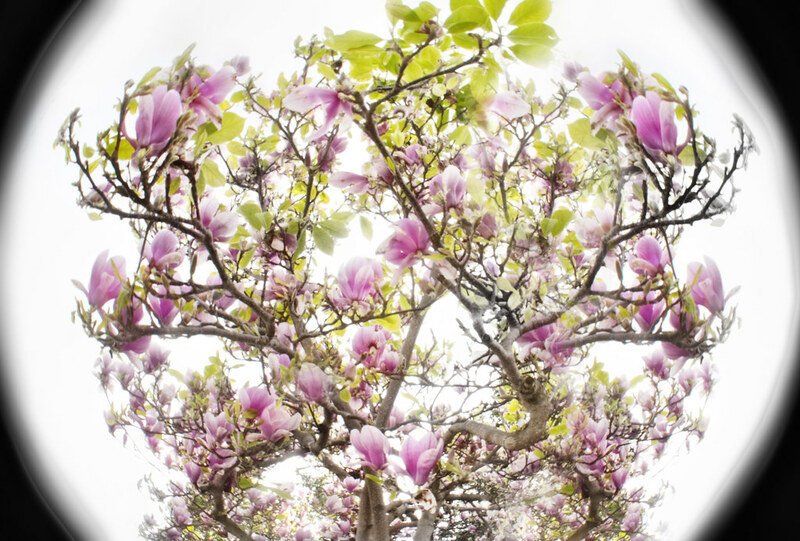 I put the camera on tripod up very close to the magnolia tree and used the f/22 aperture ring. I intentionally overexposed to create a high-key effect. In post-processing I used FocalPoint from onOne Software, a Photoshop plugin, to give the image a sense of focus in the middle and to help blur the edges. Then I partially desaturated the image using the High Structure filter in Nik Silver Efex Pro. My goal was to get the image looking almost like old-fashioned needlepoint. 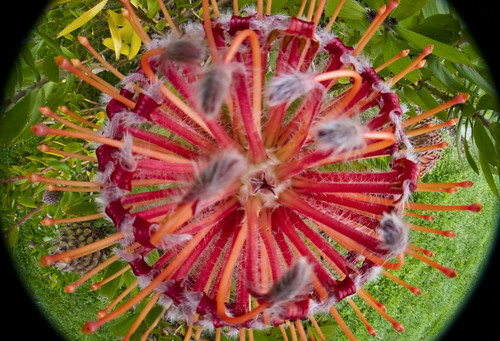 Leucospermum Fisheye, photo by Harold Davis. View this image larger. This is a close-up fisheye of my Leucospermum Scarlet Ribbons. 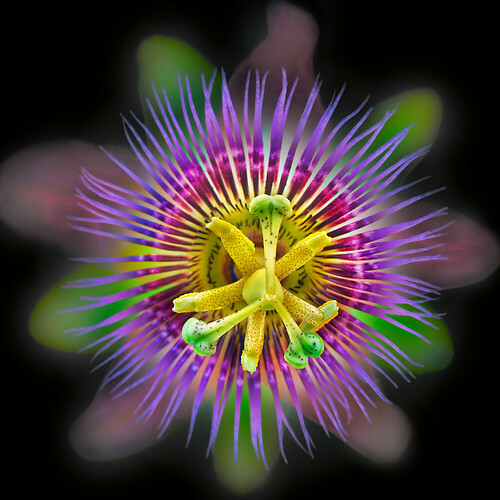 I photographed the flower with the Lensbaby Composer and the new Fisheye Optic. The image you see is a hand-HDR composite of five exposures, all at ISO 100 on tripod. 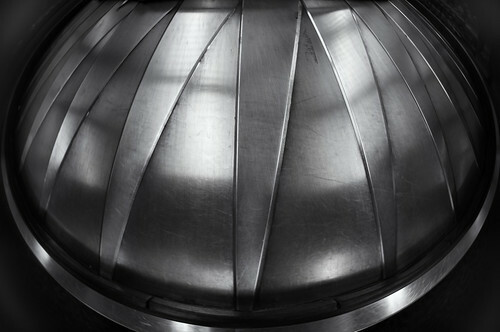 Each exposure used the f/22 aperture ring. Exposure time ranged from 1/4 of a second to 1/30 of second. Shot with a Lensbaby Composer and the standard glass optic, using the f/4 aperture ring. 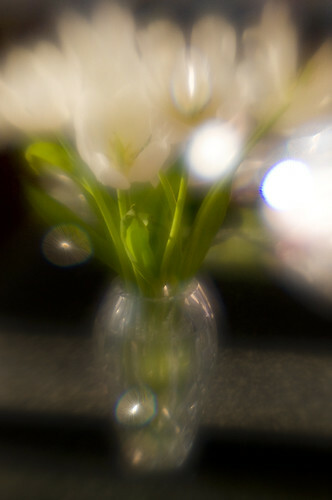 I love my Lensbaby, a great spur to creativity when I’m feeling like trying something different. 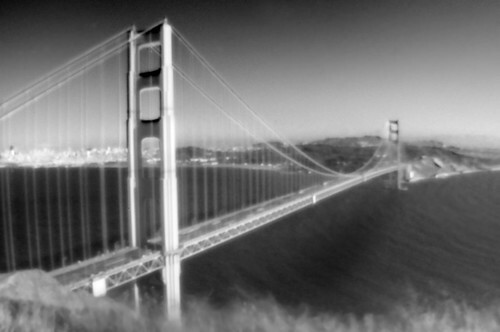 Check out my Lensbaby set on Flickr. Calypso Orchid, photo by Harold Davis. View this image larger. In mid-April the Calypso Orchid grows wild on the forested slopes of Mount Tamalpais. 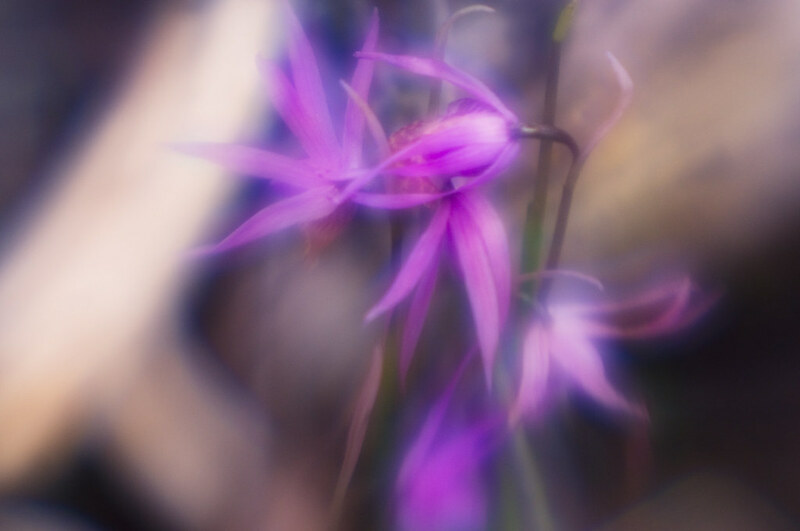 I photographed these Calypso Orchids near Cataract Falls on tripod with a Lensbaby Composer. I used a +4 close-up filter and the plastic optic swapped into the Lensbaby to give the images a soft and dreamlike atmosphere. 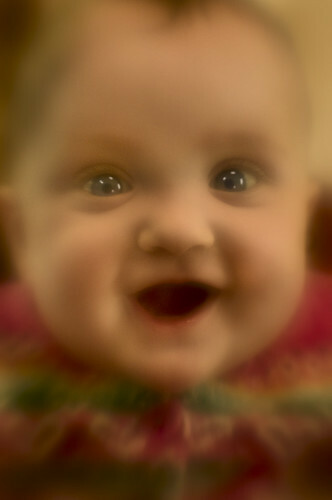 Lensbaby Baby, photo by Harold Davis. My Dad likes to photograph me with all kinds of weird lenses, first the fisheye and now this Lensbaby Composer with a plastic lens. Dad says he switched in a plastic lens, and trained the “sweet spot” on my eyes so that they are in focus and the background blurred. What are you going to do when your father is a photographer? Sometimes he gets into Photoshop and makes me look like an old painting. I think that’s funny. Anyway, World, here I come! My Dad has taken me to playgrounds for the first time, and I’ve met girls my own age named Ingrid and Samantha. Dad can’t resist telling their moms the story of my birth, how small I was when I was born, and how I beat the odds. Dad says they gave me a “low single digit percentage chance” and that I am a true miracle. So I say, World, you ain’t seen nothing yet. Here comes Katie Rose! Zebra & Jaguar, photo by Harold Davis. View this image larger. Strolling down the avenue with my baby in the carriage and my Lensbaby around my neck I passed a red, antique Jaguar MK2. 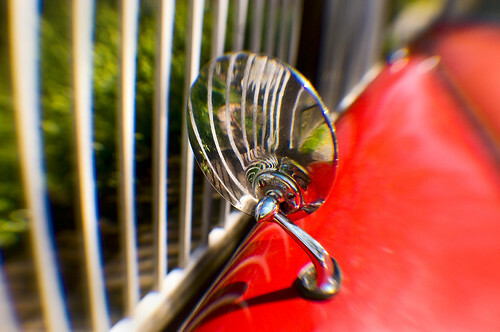 I aligned the Lensbaby Composer “sweet spot” with the front of the Jaguar mirror showing the reflection of the Zebra-striped white fence. This shot was taken with the f/4 aperture ring and the wide angle auxillary lens, handheld at ISO 400 and 1/3200 of second. 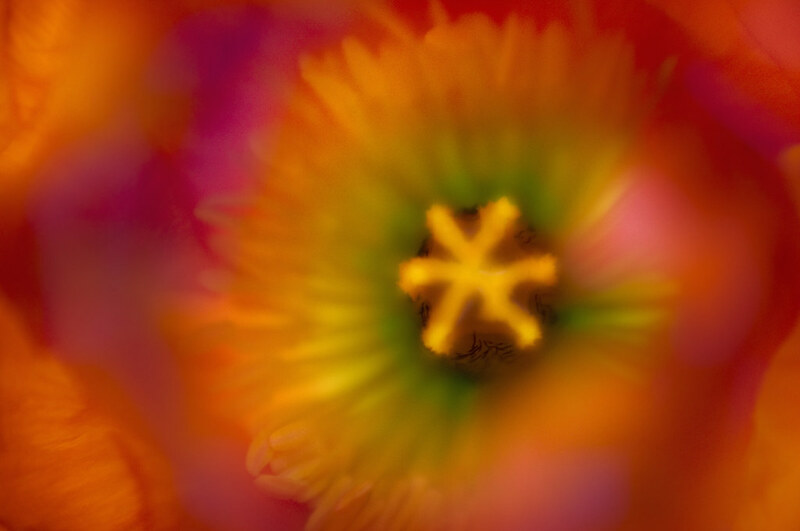 Related image: Mighty Mite; more Lensbabies. Portrait of Nicky, photo by Harold Davis. I took this portrait of Nicky—now missing his snaggle tooth and with a gap—using my new Lensbaby Composer with the optic swap system, plastic optic, and the 0.42X super wide angle auxillary lens. I used a shutter speed of 1/1000 of a second on manual exposure control (there’s no way to control the aperture with the plastic lens attachment). I’m still getting to know the Lensbaby Composer system, but I’m currently wild about it. 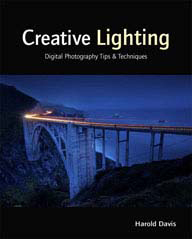 A great new universe of totally weird creative possibilities that are far away from the f/64 school of photography (and I say that with true affection for both approaches). 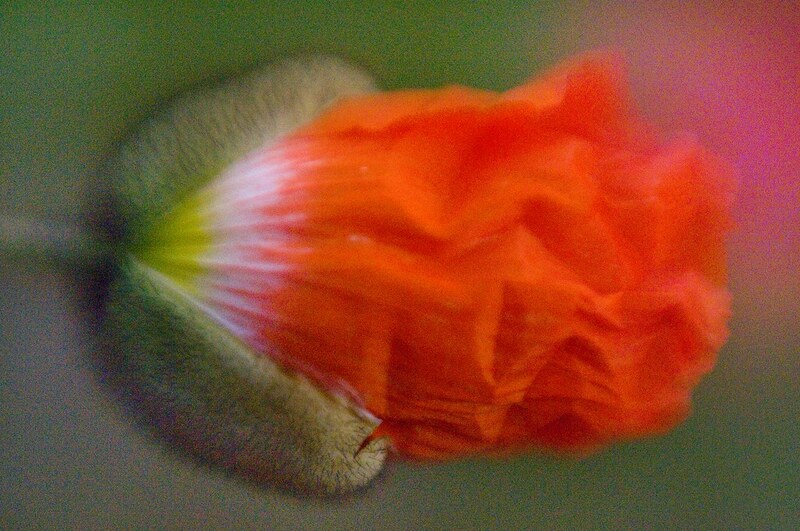 Lensbaby Poppy 2, photo by Harold Davis. View this image larger. After photographing a Papaver nudicaule being born, for the next few days I continued in the same damn the torpedoes full speed ahead hand held ignore the noise high ISO fashion, taking photos with my Lensbaby 3G as the poppies emerged. Both photos: Nikon D300, Lensbaby 3G, hand held. Photo above: +10 close-up filter, no aperture ring, 1/250 of a second, ISO 100. Photo below: +4 close-up filter, f/8 aperture ring, 1/125 of second, ISO 2000. Being Born, photo by Harold Davis. View this image larger. 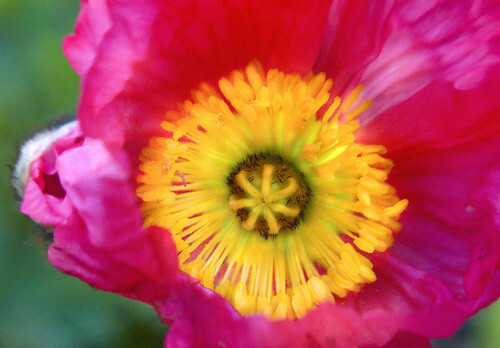 Within the short life span of the poppy flower (Papaver nudicaule shown here), being born, or emerging from the pod, is a significant percentage of the total. Even so, the duration of emergence is short enough that it can be over if you go inside for another lens. This has actually happened to me: by the time I got back a few minutes later, the flower had emerged. I photographed this poppy birth just before dusk on the first sunny day after a period of rain. I knew it was dark, and the flower was moving in the breeze, so I needed a fast shutter speed (and there was no point in a tripod). In the situation, I decided to take the noise is beautiful approach, and used an ISO of 3200 at 1/400 of a second with the f/5.6 disk on my Lensbaby 3G (equipped with a +10 close-up lens). I started with a Lensbaby 2.0 and am now using the Lensbaby 3G, which I consider a great improvement because you can lock the lens into position. I have had no problems with my Lensbaby whatsoever. I completely recommend the Lensbaby if you understand what it is: a special purpose lens that can create unique images and unlock creativity. However, it’s certainly not a general purpose lens, and there are many situations in which I would never use it. Related links: My Poppies on Flickr, Lensbaby on Photoblog 2.0. 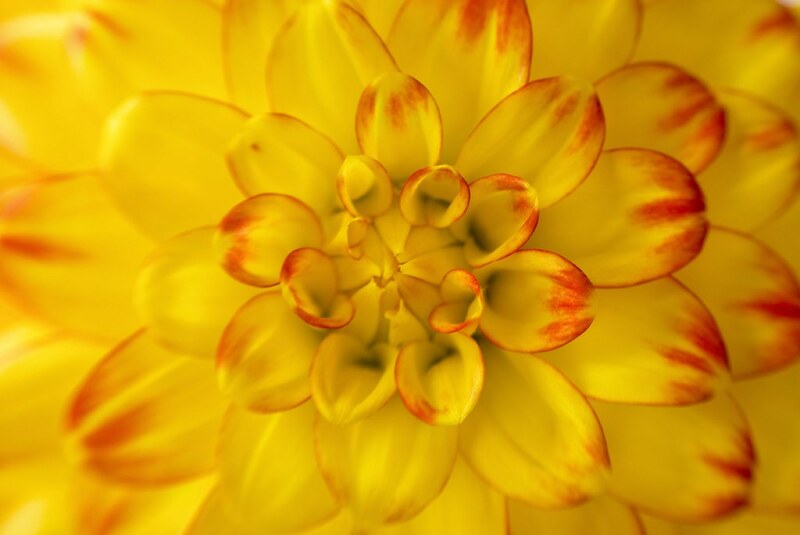 Dahlia Daze, photo by Harold Davis. View this image larger. 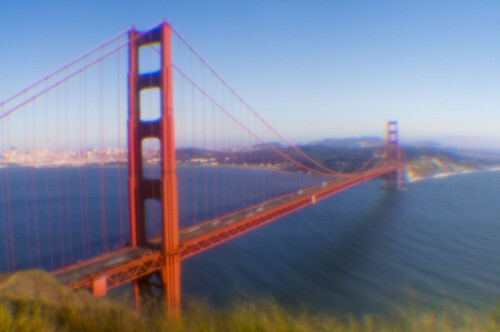 I took this photo with my Lensbaby 3G. It’s a 3/10 of a second, tripod mounted exposure using the f/8 aperture disk at ISO 100. The ability to lock this selective focus lens in position (not possible on the earlier Lensbaby models) made it possible for me to take this shot.